It was a long and winding path that caused me to find myself in Vanuatu. The archipelago that James Michener wrote about in Tales of the South Pacific, and the country that was voted the happiest place in the world! From the time I could talk I was obsessed with fish & fishing, not surprising considering our house was an ode to all things piscatorial. My father Trevor Housby had made a life out of fishing, penning 53 books, more articles than I would care to count for most of the major angling publications throughout England & Europe, catching sharks in the UK, game fishing around the world, and being the inventor of the infamous trout fly the Dog Nobbler. I first went big game fishing with him in Kenya at Hemingways in ’91. On that trip we caught Sailfish, Yellowfin, Dolphinfish, Wahoo, Mackerels, GT’S, a bit of everything really. For an 11 year old kid it was a dream come true! The next opportunity I had was just two weeks after the old man passed away suddenly, we were due to go to Madeira together and fish with an old family friend who had not long started a charter operation there on my father’s suggestion. Madeira is a home away from home for me as that’s where my mother is from. So at the age of 13 I flew there on my own, to be greeted at the airport by Roddy Hays. The first day we fished one of the customers caught a Blue Marlin of 800lbs + and from then on I was the one that was well and truly hooked. I would crew on boats there during my summer holidays, until I was old enough to not worry about school getting in the way. I did 10 season catching a lot of giant Blue Marlin and fishing with some of the very best Captains and Crews in the world. As the fishing slowed down in Madeira I started to fish lots of other places in the next few years, Ghana, Bom Bom Island & Brazil for Blue Marlin, The Great Barrier Reef for Black Marlin, and up and down the East Coast of Australia for a mixed bag of Stripes, Black and the odd Blue marlin. In 2004 I was asked to go and crew on a fly fishing expedition to Vanuatu. I had heard about the quality of fishing in this remote island chain and I soon signed up for the gig. The trip was put together by Tom Evans, a multiple world record holding fly fisher who only targets billfish, and tarpon when he’s home in the US. To cut a long story short Vanuatu did not disappoint, we caught the first ever Blue Marlin on 12 lb tippet for a new world record, the next year we caught a the 16lb tippet record with a Blue Marlin that weighed in at 273lbs, which is still a current record today. I decided to make Vanuatu my home and for the past 15 years I have been based here. In that time I have crewed and run a few different boats, managing to catch some more records along the way. My favourite of which was 136lb Dogtooth Tuna on 16lb line for a female world record! Two years ago I purchased my current boat Nambas, she is a 40 foot Blackwatch that was custom-built to fish Cairns and set up to be able to live on board for up to 10 days at a time. The boat has massive amounts of refrigeration, air condoning, water maker, generators, inverters, double state room, another double cabin and a spacious fly-bridge. She carries 2000 litres of fuel and is powered by two C9 Cats, cruises at 25 knots and has a max speed of 30 knots! On board we carry a complete set of Shimano gear from 130lb chair rods, 30lb - 50lb -80lb stand-up rods, popping & jigging set ups and some heavy fly rods, there is something for every occasion and it’s all rigged and ready to go at a moment’s notice. Nambas really is the perfect vessel for what we do here as she is so spacious, fast and comfortable to fish on. We run a selection of different charters ranging from half days to multiple day live on-board trips through the islands, catering to all levels of angling skill. From first timer’s to the popper and jig obsessed, fly fisherman, heavy tackle marlin chasers and world record hunters fishing ultralight tackle for a multitude of species. We can do it all, and over the course of a year we do. Vanuatu is a year round fishery, you can catch Blue Marlin and Yellowfin Tuna every day of the year here. In fact we were lucky enough to catch the first Blue Marlin in 2017, we are one of the first time zones in the world and by 10 am on New Years Day we had caught two fish of 450 & 500 lbs. After checking with the guys at Billfish Report, they confirmed that they were certainly the first they had heard of, which was pretty good way to start they year! Dogtooth and GT’s are also year round propositions, with Sailfish, Blacks, Stripes and Wahoo being more prevalent from April to September when the water is cooler. On day trips when we fish offshore we focus on Blue Marlin and Yellowfin Tuna, both of which can get pretty big here. I have caught Yellowfin to 213lbs and Blue Marlin to 1142 lbs. Our best day of marlin fishing was last year and we caught 7 fish from 9 bites. Inshore on day trips we focus on Sails, Wahoo, Black Marlin and Dogtooth Tuna, all of these are found in 50 to 200 meters of water on the edge of the reef, often we troll dead skip & swim baits or live bait for them. Jigging these areas can be very productive too, often adding a few of the reef species to the daily tally. There are also Multiple FAD’s (fish aggregating devices) here that hold huge numbers of Yellowfin Tuna and Skipjacks year round, and in season lots of Dolphinfish. The popping and jigging at the FAD’s can be out of control, with multiple catches of Tuna ranging from 30lb to 150lb, the only problem can be that at times the Marlin keep interrupting the party and eating the poppers! Our live aboard trips range from 3 to 10 days, on these trips we do a bit of everything but the main focus is on jigging and popping for Dogtooth, GT’s, Red bass, Maori Wrasse, Jobfish and a host of other reefies. There are 83 islands to fish around with hundreds of seamounts, reefs and drop-offs to fish. Most evenings we anchor behind different islands, some of which have live volcanoes on them, all of which have swaying palm trees, happy locals, and white sandy beaches. We have two chefs on board so with all of the fresh seafood, local grass fed beef, organically grown vegetables and tropical fruits we eat amazing food. Between the jaw dropping scenery, the superb fishing and the locally grown food it really is a unique experience. 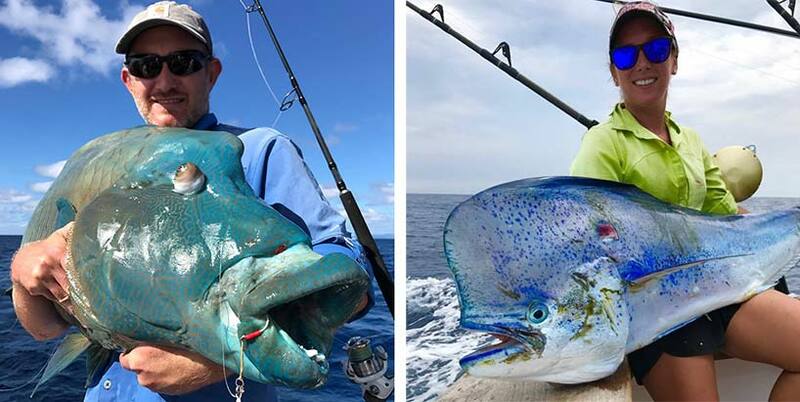 With Vanuatu only a 3 hour flight from Brisbane and Sydney, and so many Brits travelling further afield in search of great fishing, it really is a place that should be on your bucket list if you’re a globe-trotting angler. I was born and raised on fishing, as the son of a prominent angling journalist, my future could only be in fishing. I grew up fishing for anything that swam, fly fishing for trout in the chalk streams of England, to fishing for Porbeagle sharks in the English Channel. For the past 14 years, I've been fishing in Vanuatu spending a lot of that time blue water fly fishing for Marlin, Dogtooth, Sailfish and Wahoo.